Cats causing damage by scratching furniture and other household items is a common complaint among cat owners. Although, this can be frustrating, it is important to remember that scratching is a normal and natural behavior for cats. 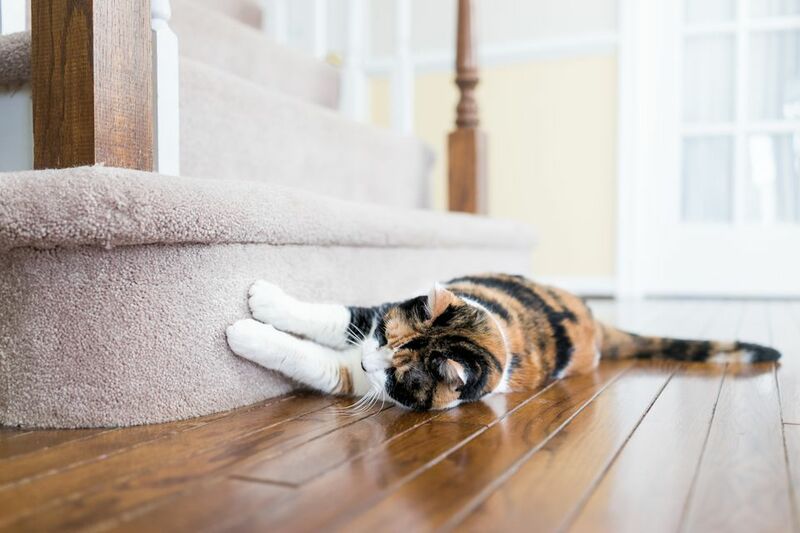 Even though the urge for cats to scratch is normal, scratching places we feel are inappropriate, such as our couches and stairway posts, makes it a destructive behavior. Luckily, this is one which can be easily prevented and managed. Scratching is an instinctive cat behavior, and it's vital for their physical and mental needs. By understanding your cat’s scratching behavior, you can prevent damage to your home. There are various reasons why cats scratch. To maintain necessary claw motion used in hunting and climbing: Cats are natural hunters and they use their claws to capture and hold prey. They also use this motion to exercise the forelimb muscles and spine to keep them in good condition for hunting. Offense and defense: Cats use their claws to defend themselves during conflicts with other cats or other animals. Emotional outlet: Cats scratch to relieve stress and scratch when they become excited or aroused. Have you ever seen your cat slowly walk by a cat in your home and then begin scratching? Scratching allows the cat to release their frustration. Has your cat ever started scratching as soon as you came home from work? In this case, it's out of excitement as scratching can be an expression of joy. Strengthens and stretches their muscles, and it's a form of exercise: Scratching is a good form of exercise and helps to keep your cats in shape. They get to stretch out their bodies and extend and retract their nails. Just like many of us, cats like to stretch when they first wake up. Marking behavior and communication: Cats scratch to communicate with other cats. When they scratch, they leave scent and visible markers. Their paw pads have scent glands, which leave odors behind when they scratch so that other cats know that they have been in the area. When cats scratch objects, they also leave small gouges, which are visual signals to other cats in the area. Feline nail care: When your cat scratches on an object, it removes the outer dead sheath of the nail and exposes the healthy new growth underneath. It is not uncommon to find crescent moon shaped nail sheaths around your cats favorite scratching spots. Fun: Cats love to stretch, scratch, and play! How Can I Prevent My Cat From Scratching? The short answer is you can’t. Scratching is a normal behavior for your cat. It is unreasonable to expect this behavior to simply not exist. Cats are going to scratch, and we need to provide appropriate outlets for them to express and experience this natural and instinctive behavior. Do not punish your cat for scratching. This includes squirting with water, shaking a can of pennies, etc. Punishment does not teach the cat the correct behavior, can increase fear, anxiety, and stress, and could damage the bond between you and your cat. Cats need to scratch so we want to provide them with appropriate outlets for this behavior by providing suitable surfaces to scratch. Always have plenty of acceptable scratching areas for your cat with a variety of surfaces and textures. Scratchers come in multiples styles, sizes, and materials. It is important to experiment with a variety of substrates and types of scratchers to determine which your cat prefers. Some examples of what most cats prefer are scratching posts or pads made with sisal rope, cardboard, wood, and sisal fabric. It is best to offer both horizontal and vertical scratching surfaces. Scratchers should be sturdy and not wobbly or fall over when your cat is scratching them. Cat scratching posts need to be tall. Your cat should be able to stand on their hind legs and fully extend their body up the side of the post so they can get a full-body stretch. The placement of scratchers is important. Our cats like to be with us so place them in areas where you spend time as well as where your cats spend their time. Cats often stretch or scratch when they wake up, so consider placing one near where your cats sleep. Cats also scratch when in a tense situation or as a way to displace anxiety. Locate and place scratchers in all the areas where you think your cats would appreciate it most. Do not hold your cat near the scratching post and force her to drag their claws on it. We don’t enjoy being forced to do things and neither do cats. This can scare your cat and cause them to avoid the scratcher completely. Instead, make the scratching areas you want the cat to scratch more appealing. You can do this by placing catnip or silvervine near them or attaching toys to the scratching place. You can give your cats treats and play with them on or around it too to help create a positive association with the scratcher. Lastly, because one of the reasons cats scratch is to communicate through scent, you can apply Feliscratch. Feliscratch is a product that has been created by Feliway to mimic the scent that cats spread to other cats when scratching. By mimicking your cats’ messages, Feliscratch encourages your cats to scratch there again. If your cat is scratching furniture, identify your cat’s preferred scratching scenario by studying where your cat inappropriately scratches, Is it horizontal? Vertical? What substrate is it most similar to? Cardboard? Wood? Based on your cat's preferences, buy scratching posts or pads that are similar to your cat's preferred scratching set up. Place an acceptable scratching post based on your cat's preferences near an inappropriate object (for example, couch). When your cat is consistently using the scratching post it can be moved very gradually (no more than a few inches each day) to a location more suitable to you. It's best, however, to keep the appropriate scratching objects as close to your cat's preferred scratching locations as possible. When your cat is scratching their scratchers, reward them with a treat, verbal praise, or a pet. Remember, what one cat finds reinforcing may not be reinforcing to another cat so reward your cat in a way they enjoy. Since claws don’t wear down naturally, your kitty needs to groom them by scratching a textured surface, like your furniture or carpets. Regular toenail clipping helps prevent destructive clawing, and also helps prevent her nails from getting snagged and torn on anything. Take a deep breath and be gentle and calm. Prior to starting, purchase specific cat nail trimmers that are comfortable to handle, are rubber coated to avoid slipping, and that have a stainless steel blade. Cut your cats nails in a quiet room without distractions. It is important to provide a non-slip surface for cats to stand on like a yoga mat. When choosing a time to cut nails, best to do when your cat is relaxed and not mid-play for example. Clip one nail and offer a treat at the same time. If your cat stays relaxed, then trim the second nail while the cat is eating; if your cat stays relaxed, build up to trimming five nails in one session. Be ready, at first, to only clip one paw, or even only one or two claws, while your cat gets used to it. Most cats’ experiences with nail trims are far from positive, which results in cats not liking nail trims. Before starting, have some delicious, extra special treats your cats only get during nail trims. A few examples are canned food, whip cream, tuna fish, and anchovy paste. You can also give your cat a cuddle, brush, or play session after depending on their preferences. Within a cat’s nail, there’s a pink part higher up called the quick. It contains all the nerves and blood vessels, meaning that if you cut into it, it will be painful for your kitty and will bleed. When cutting the nails, it's easy to see where the quick starts, so you can avoid nicking it. If you do cut into it by accident, you can stop the bleeding fairly quickly with a styptic powder. If your cat is resistant to claw trimming or to having her paws handled, a qualified training specialist can help you teach your cat to accept and even enjoy nail trims. A boring environment can lead to destructive scratching and other behavioral issues, so it's important to provide cats with enrichment to help prevent this. Providing enrichment for your cat allows your cat to express these behaviors. An enriched environment should provide various types of scratching surfaces, outlets for predatory and prey behavior, safe places, and should provide an environment in which an animal has variety, choice, and control over their daily activities. Scratching is an instinctive behavior needed for your cat's physical and emotional well-being. Unlike human nails, which grow from skin, cats’ claws grow from the last bone in each of their toes. Declawing (onychectomy) is the amputation of this bone, which also involves cutting the tendons, nerves, and ligaments to which the bone is attached. It is a major surgical procedure that can put your cat at risk for a variety of physical and behavioral problems. In many countries around the world declawing is illegal, as it is considered inhumane. Help! My Cat Keeps Scratching the Carpet! Is Your Cat Pooping in Your Bathroom Fixtures?